Rita Wilder recognizes the Hauser team of Emils Vigants, Krista Blackburn and Kiersten Meister as the winner of this year's Maverick Challenge last week at the Columbus Area Chamber of Commerce's annual meeting. This was the first year for Hauser to field a team, said Cindy Frey, president of the Columbus chamber. The Maverick Challenge was started 11 years ago by the Columbus chamber. Teams of students take their business idea from a concept, develop it into a business pitch and then present their ideas to a panel of judges consisting of entrepreneurs, service providers, educational representatives, and other community leaders. The Hauser TempSense team of Emils Vigants, Krista Blackburn and Kiersten Meister created a product and service that will help kids get interested in computer science. 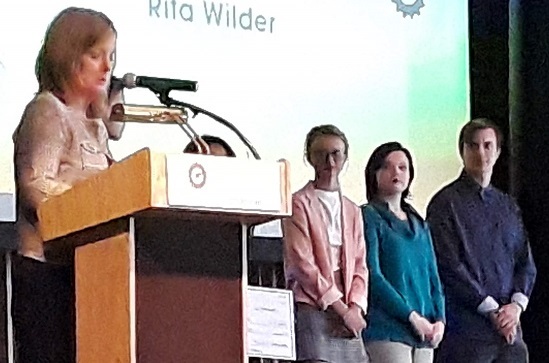 "These teaching toolkits are developed by students, for students," said Rita Wilder, a partner at Gresta, Storms and O'Leary CPA firm, who presented the awards on Thursday. They wowed the judges with the product prototype and a thoughtful business plan. It awards them the first place prize of $1,500." The winner of the Bartholomew County competition is recognized at the Chamber of Commerce's annual luncheon, which is being held today, March 28th from 11:30 a.m. to 1:30 p.m. at The Commons in downtown Columbus. The Hauser team also competed in the regional Maverick Challenge competition, held in February in Seymour, but did not advance to the state competition, which is being held next Wednesday in Indianapolis. The regional competition included teams from Bartholomew, Scott, Jennings, Jackson, Franklin, and Ripley counties. The winning team, from Jennings County, is competing next week in Indianapolis for the 2019 Innovate WithIN™ pitch competition, hosted by the Indiana Economic Development Corporation, Indiana Department of Education and Ball State University.